Get more people to find you when they search for services like yours. Put your website directly in front of more people who might need your services. 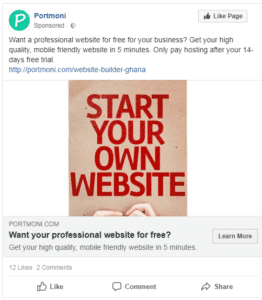 Going in front of people: an example of Facebook ad to get more visitors to your site. For the first set of techniques, the goal is mainly to rank higher on search engines such as Google or Bing. It includes techniques like content marketing, Search Engine Optimization (on-site SEO and off-site SEO), or link building. Overall, this is very competitive (millions of websites are trying to do the same), and very technical. It also takes time, usually several months or even years, to start seeing results when you start from scratch. The second set of techniques involves getting in front of potential visitors, and attracting them to your site. It includes techniques like social media marketing, online advertising, or email and SMS marketing These techniques allow getting results quickly. Using online advertising to promote your website. Getting other websites to link to your own site. And finally promoting your site using email marketing and / or SMS marketing. You can also feel free to repost similar content at different times, as only a small fraction of your audience will see each post. What is important is to include a link to a relevant resource on your site, to drive traffic. Engaging content will lead people to like it and share it: those interactions are what makes Facebook decide to show this content to more people, and how it will ultimately reach people outside your direct network. If your own Facebook page has a limited reach (i.e. you have less than 10,000 followers), an interesting way to get in front of people is also to post or repost your content in relevant Facebook Groups (industry groups, buy and sell groups…). This will probably lead to better results. Depending on your focus, posting on other social media like Twitter and Instagram can also be helpful, as well as sharing in relevant WhatsApp groups. Could you start posting once or twice a week on social media, and include a link to your site in your post? Are there Facebook or WhatsApp groups where you could share content with relevant links? 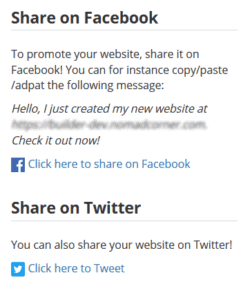 In some platform like Portmoni you can also share your website easily with suggested content. Another tactic is to use paid search and social media advertising to get more visitors to your site. They are excellent ways of attracting a lot of visitors, building your brand and getting your site in front of many people. Each paid channel has its pros and cons. To get the best results out of your budget, it also involves having an understanding of the keywords and target demography that works for you, and take them into account in your strategy. Online ads can be very valuable and efficient, especially with Facebook advertising. Did you already try online advertising? Have you done some offline advertising that could be replicated online? Another technique is to get links to your site from other sites that your potential target visitors are visiting, and lead these visitors to come to your own site. To do that, you can offer to write content for these sites, such as guest blog posts. Another way of doing that is to provide valuable content on Question & Answer sites such as Quora or the equivalent local ones in Ghana or Africa. 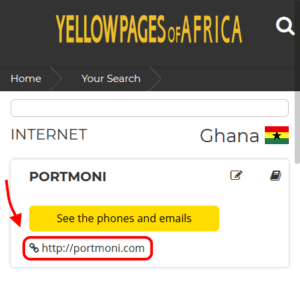 You can also get referenced on an industry association site, or online repertories such as the online Ghana Business Directory. The possibilities are endless! It requires some work but is very valuable, as in addition to the direct traffic it will also have a very positive impact on your Google rankings. Indeed, Google uses the number and quality of links to your site in its algorithm, and consider that a site with a lot of quality links is very valuable. Are there any directory you could submit your website to? What are the leading regional blogs in your industry, that you could approach? Finally, as you know, your existing contacts are your best prospects. An interesting tactic is to get in front of them by promoting to your email and/or SMS list with email marketing or SMS marketing. Using this, you can drive them back to your website on a regular basis. New products launches, special offers, or even industry news are good opportunities to contact them. When customers buy consumables, getting back to them at the end of the typical period when it runs out can be a great tactic for e-commerce also. Do you have a list of emails or SMS of previous customers you could contact? What special offer could you make to incentivize them to buy more? Social media marketing, online advertising, getting links to your site, and email or SMS marketing are great tactics to increase traffic to your site. My advice: just pick your favorite one and get started, you can’t go wrong!